Why yes, I'd like to spend my night driving up and down a mountain. Which is what we did for an hour a few weekends ago. Mike's good friend Jon, his wife Heather, Mike and I were supposed to go to a haunted house, but the line was so long we decided it wasn't worth it. So we drove up the canyon and up one of the mountaisn to find the campfire Jon's sister Jessie and her husband made up in the woods. But they pick some random spot way back in the woods so we were driving longer than we were actually at the fire. But we had fun in the car. Heather and Jon eat out most days of the week, so I'm going to teach Heather a few easy meals. Ah! The fires of hell! Just kidding. I'm just so, so awesome at taking pictures. Clearly I am talented. But seriously. This is kind of cool. When I was 11 we moved from a suburb of Philadelphia in Pennsylvania to a town an hour outside NYC in New York. My new classmates in NY were amused by my accent (mostly the way I said "O's") and used to make me say that sentence - "I like to eat scones while I'm wearing my boots." To laugh at me, basically. Yeah, thanks you guys. That's just a tidbit I thought I'd share. It doesn't really have anything to do with this post. Except for the scone part. Speaking of scones, though, they look so unhealthy when you're cooking them. But they look SO GOOD when they're done. The other day I made scones, rolls, and a loaf of bread and brought them to the woman I visit teach. She had had a baby the month before, and I figured she could use some homemade bread. Can I just say that I am so glad that Mom is a good cook and has passed those skills to us? I always love making food for other people that I know they'll enjoy. I know eating good food always makes my day a little better, so to be able to do that for other people is just awesome to me. Thanks, Mom! Mike likes it when I cook, too. Most of the time. Even though he doesn't eat my homemade bread when it's around the house. What's wrong with this boy? So we took our annual Firehouse Carwash Powell trip early September. It was nice to get one final weekend of fun out on the water before fall. I showed them my Sloth face, but I will never allow anyone to take a picture of it. It got a little cold Sunday, but we still went exploring. We climbed random roper hanging off the side of cliffs. 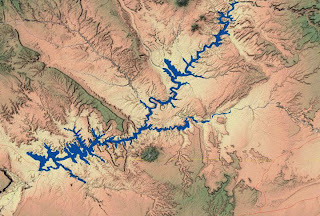 For those of you who haven't been, Lake Powell is a man-made reservoir that has a million little run-off canyons. They're pretty beautiful to explore. Colin (General Manager of Mike's work) showed off his strength. Boys did flips into the water. We love Powell. Can't wait to go back! Ok, so I didn't work for 500 days this past summer, but I do really want to see that movie. I hear it's good. Anyone seen it? What I DID do was work as an intern at Terry Deru's investment management firm in Salt Lake called Belsen Getty. I did pretty much...whatever they needed me to. And learned about market research on morningstar, how to choose mutual funds...cool stuff like that! Speaking of Terry...It was almost like working with my Dad every day. Dad and Terry are best friends and pretty much have the exact same sense of humor which includes always having a joke about EVERYTHING. Oh you two. I couldn't walk down the hall without being harrassed by Terry (when he wasn't on the phone...which wasn't often.) But if harrassing Terry back is something a good intern wouldn't have done....I was a horrible intern. My desk space (including Tavin's old hoard of Vault Zero behind the trash). Jackie and Joni. We all had a new craft to show each other every week. Jordan. I don't think I've heard so many "dudes" and "right ons" come from one person's mouth in a single eight-hour period. But I give Jordan props for putting up with me for two months. Jordan was really proud of his ability to make labels with the "wood" background. So I labeled most everything on his desk with it for him one day. In case he forgot that those things were his. Janson is Damon's wife's brother and also works for Terry. I became pretty fond of harrassing Brandon by the end of the summer. I think he enjoyed it. Mike, another advisor. Tom was gone when I took pictures, but he's the fourth advisor at BG. And I even got to see Shunae and her little girl! Cute.